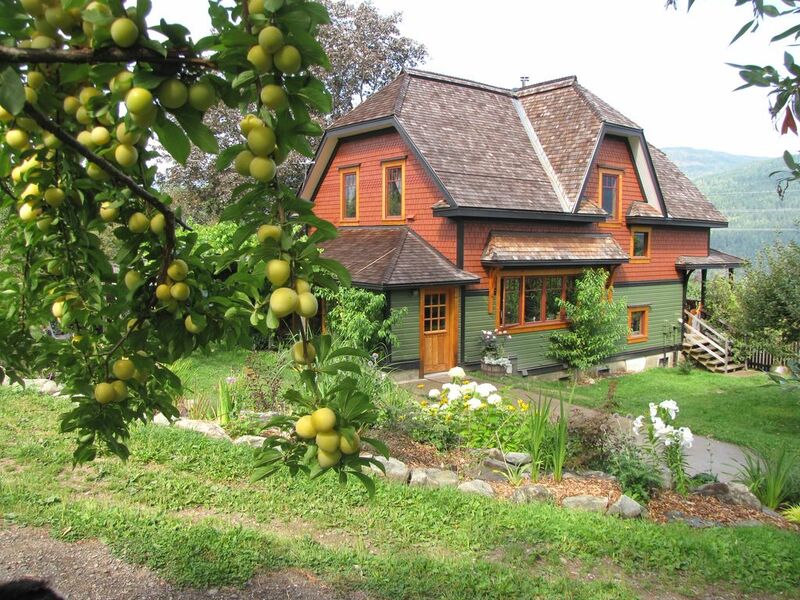 Beautiful, lovingly built by a Swiss carpenter eco suite on our organic farm ( Arrowhead Farm). Enjoy the fresh air and space of the country setting only a 10 min drive from downtown Nelson. 30 minutes to Whitewater Ski Resort. Arrowhead Farm is situated on a quiet road, away from the highway, but easy access from town. BioBio Suite is on the first floor. There are no steps from the parking to the suite and none within. The main suite is occupied by the owner. There is no overlap of living areas ensuring peace and privacy for both. BioBio suite has its own entrance and a fenced in yard separate from the yard of the main house. It has a lovely private patio. The suite has lots of natural light from its many windows. We designed the suite with In-floor geothermal heating, air exchange for the best indoor air quality and comfort of our guests. Only the best materials were used: solid wood, stone, low VOC paints to make for the healthiest environment possible. At 400 square feet, the suite is ideal for a single traveler or a couple, but would accommodate a family with up to 2 children. The suite consists of a living room, kitchen, bathroom, and 1 bedroom. The living room has a brand new leather sofa that unfolds into a full bed with a comfortable mattress ( BeautyRest) for additional sleeping spots, an armchair and an antique cabinet containing a TV. The bedroom has a queen bed with a brand new memory foam queen mattress, bedside tables, a closet and a dresser. The bathroom is compact with a toilet, a shower, a sink and a washer and dryer. The kitchen is beautiful with its wall of windows and the view of the valley, custom made walnut cabinets and granite counter tops. WiFi ( can be turned off on request), washer/dryer, fully equipped kitchen, TV, Netflix. While staying at the BioBio Suite you will have an option to buy our farm fresh organic produce, Kootenay Local Agricultural Society certified. We are a family of 4 and we live in the main suite and run our organic farm. Martin is a carpenter, Tanya is a teacher. Both of us grew up in the mountains- Martin in the Swiss Alps and Tanya in the Northern Caucasus, Russia, so we feel at home here in the Kootenays. We think it just doesn't get any better: the natural beauty of the country setting with its abundance of clean water, air, amazing mountain views and space to grow organic food for our family, all only a 10 minute drive away from the amazing community of Nelson with its arts and recreation. Skiing, hiking, biking, fishing, sailing, theater, designer stores, gourmet restaurants- Nelson has it all. We are just outside town, so you can have it all: the peace of the country setting, organic veggies and fruit, beautiful views and swimming in our private natural ponds ( and they are warmer than the lake! ), all minutes away from the markets, boutiques and restaurants of Nelson. Mountain bikers: don't bother with your car! The glorious Morning Mountain biking trails are accessible from our house ( the head of the trails is 2 km down our road). We are short drive away ( 30 min) from the Whitewater Ski Resort- come ski the famous champagne powder. We love our community and will help you with information on how to enjoy it to the fullest during your stay. A bathroom with toilet, sink, shower stall and washer/dryer. High speed, WiFi or hardwired connection. Can be turned off or on. The living room leather sofa can be unfolded into a double bed. Apartment size under counter fridge with freezer box. 4 burner electric stove top. Beautiful custom built kitchen, walnut cabinets and granite counter tops. No particle board, Low VOC paint for the best air quality. A wall of windows with an amazing view. The dining table is in the kitchen, 4 chairs. We really enjoyed our vacation there ! Hosts are welcoming. There organic fruits are so good ! Nature is beautiful, relaxing, the view is magnificent. Peacefull place. The pictures are very representative ! Thank you for being such wonderful hosts! The suite was perfect for us! The listing description was accurate, the place was very well maintained, and you both as the owners were amazing to deal with and very accommodating to our needs, like the storage of the mountain bikes we travel with. We would definitely rent from you again if we come back to the area and I was so glad our boys all got along well and had some fun! Thank you, Paula! We hope to host you again! All the best! We stayed for an entire month as we were in transition to the Nelson area. The suite is comfortable, well equipped, and so quiet! Beautiful views across the valley. Martin and Tanya are very nice and showed us around the farm. Very convenient location. Suite stays cool even on hot days. Thank you very much, John and Traci! We are very glad you enjoyed the suite. Hope to see you around and we will be in touch about kittens, pretty sure Tulip is expecting! All the best! This is a fabulous place to stay. I recommend it! The suite was perfect, beautifully designed and finished, still very new and fresh. It had everything I needed and was comfortable and cozy. I was comfortable there on my own but also enjoyed it as a welcoming and pleasant "home away from home" in which to entertain friends and family. The outdoor patio space for relaxing and enjoying the beautiful view is lovely. The location is quiet and rural, but only 12 minutes to Nelson. The hosts, Martin and Tanya, are great and were very helpful in responding to any questions that I had. I took advantage of the offer by Martin to give me a tour of their farm and really enjoyed it. I can't wait to stay there again and would highly recommend it! Thank you so much Janet for this glowing review! We are looing forward to having you back! My family and I recently stayed at the beautiful Bio Bio farm, in its pristine and fully kitted-out guest suite. The 3 of us were warmly greeted by Martin, Tatiana's husband. We also got to meet the owners' friendly, bright and polite sons. One of them and my son Yann really hit it off and became friends in no time at all! The suite has all the amenities you can hope for, allowing for privacy and the ability to cook your own meals. We were able to buy some organic produce from our hosts whenever we needed something for a dinner. Martin gave us a tour of their organic farm, and we were amazed at the vast variety of things they grow and make (like Swiss cheeses). Tatiana was very well versed in questions we had about the region and town of Nelson. Our stay was relaxing and inspiring, and we hope to come back one day! Thank you very much for this wonderful review. We too hope to see you in Nelson. It was a pleasure hosting you and we will keep in touch! BioBio is a comfortable and affordable suite. Our family of three (12 year old child) stayed for a week at the end of July. The suite was comfortably cool despite soaring summer time temperatures. The row of kitchen windows looks out onto your own private yard where we were able to pick raspberries and blueberries for our breakfast. The yard also provides plenty of room for kids to run around in. We enjoyed the rural setting of BioBio which is only a few minutes drive from Nelson. BioBio is a great home base from which to explore the region. We drove to New Denver one day, to Kaslo on another and enjoyed various swimming beaches in the area. The owners were great to deal with and very helpful plus our son enjoyed the company of the kids of BioBio. We found the drive way a little awkward to get in an out of with two cars parked in the drive way (it would be fine if only one car). Thank you for the great review, we are very happy you enjoyed your stay. The parking is meant for 3 cars and is a back-in/ back out situation, quite common in our parts. One can also park on the opposite side of the road. Best regards and we hope to see you again! No additional charges for children 12 and younger.